While Delta doesn’t have an international first class cabin like American or United, I’ve always found that their lie-flat BusinessElite product is one of the best business class products available. Not for just the seat, but Delta provides a large pillow and extra heavy duvet that I’ve enjoyed on many sleep heavy flights. 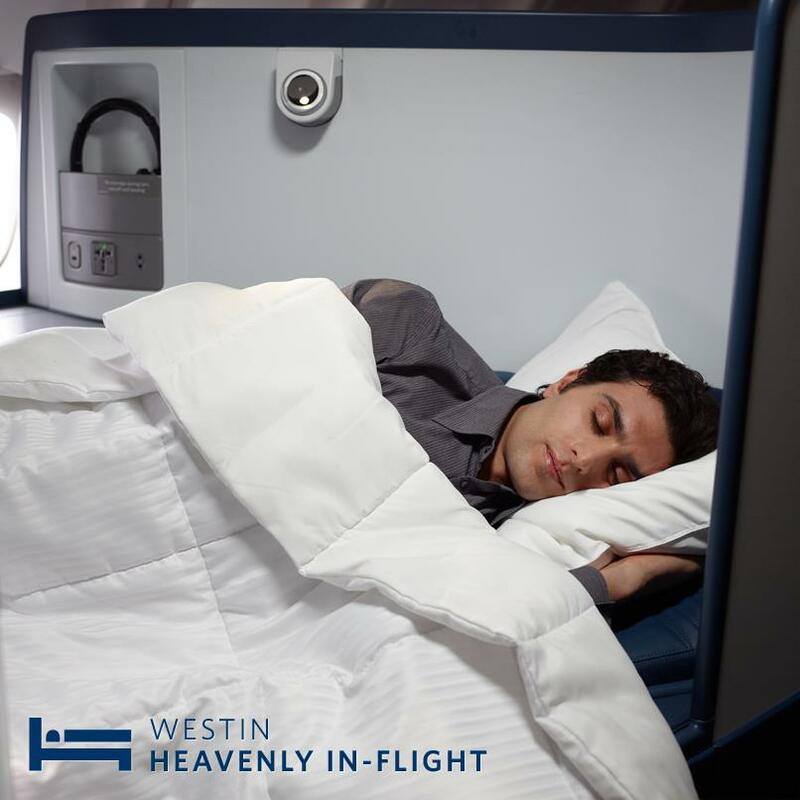 Delta seems to be taking their in-flight comfort to the next level by announcing today that they are partnering with Westin to offer the first in-flight Heavenly Bed. This is a clear extension of Delta and Starwood (owner of the Westin brand) partnership. Delta will begin offering Westin Heavenly In-Flight bedding products on all their BusinessElite international flights, as well as in BusinessElite on flights between New York (JFK)- LAX/SFO/SEA and between Atlanta and Honolulu. Customers should start seeing these new offerings in June 2013. Customers seated in BusinessElite will each receive a Westin Heavenly pillow and a white comforter, and those passengers on flights over 12 hours will also receive a lumbar pillow. Delta is adding Westin Heavenly Pillows and Comforters in BusinessElite. In addition to the new Westin Heavenly In-Flight bedding, Delta is doing more to enhance their sleeping experience while in-flight. They plan on adding a white noise channel on Delta Radio, and recently rolled out new BusinessElite amenity kits featuring Tumi and Malin+Goetz products. Delta is also adding full flat-bed seating in BusinessElite cabin on all their transcontinental flights between New York and Los Angeles, San Francisco and Seattle beginning in March 2013 (to compete with American and United who are doing the same). Delta’s new BusinessElite amenity kit. BusinessElite flights now offer an “Express Meal” that features lighter fare on all international flights departing after 9 p.m. and flights between JFK and London’s Heathrow Airport. Delta plans to create a similar express meal menu for BusinessElite flights that are less than 10 hours long, as well as transcontinental flights. In addition, Delta mentions that, flight attendants are trying to reduce lighting and minimizing cabin announcements which will help create a better sleeping experience. Delta and Starwood recently announced Crossover Rewards that offer exclusive new benefits to Delta Medallion members and SPG elite members. The program begins March 1, 2013, and provides elite members of both loyalty programs reciprocal benefits. SPG Gold and Platinum members will receive bonus Starpoints on purchased Delta fares. SPG elite members will receive one Starpoint for every one U.S. dollar. SPG Platinum members will receive priority check-in, priority boarding, and waived baggage fees. When Delta Medallions stay with Starwood, they’ll receive one SkyMile per $1 of eligible room revenue. Delta Platinum and Diamond Medallion members will receive elite check-in line access, free in-room high-speed internet access, late check-out. I think this is another interesting example of how loyalty programs and elite status in particular are evolving these days and that we’re likely to see more hotel-airline synergies in the not-too-distant future.